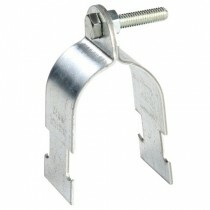 Unistrut branded 2 part pipe clamp system. Ideal for clamping various types of pipe across Unistrut Channel System. Unistrut are renowned for offering quality products and services throughout the electrical & mechanical industry . Unistrut's comprehensive range of cable management products consists of Cable Tray, Cable Ladder & Cable Basket, Channel, Brackets, Clamps and Channel Accessories.